There exist some vehicles that don’t make any sense – like the notion of the ‘performance SUV’, oxymoronic as they come. 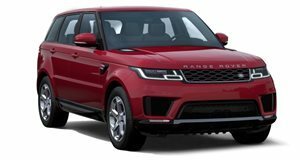 For 2018, the Land Rover Range Rover Sport Supercharged has been dropped, leaving just the Range Rover Sport SVR, fettled by Jaguar Land Rover’s Special Vehicle Operations (SVO) division. The Range Rover Sport SVR is one such oxymoronic SUV, or is it? It’s unique in this segment in the way that despite the added performance, of which there is plenty, it isn’t stripped of its off-road ability. This fire breathing all-road monster forms the elite upper echelon of Land Rover’s Range Rover model umbrella. As with many competitors in this class, space is something the Range Rover Sport SVR is not short on. But its boxy dimensions ensure that ingress and egress are easier than it is in rivals. Seating is plentiful for 5 adult occupants, with more than ample head and legroom, and cargo volume is a cavernous 28 cubic feet behind the 2nd row of seats. For 2017, a large 10.2-inch touch screen infotainment system was added to the center of the dash, highlighting the clean, focused design, and adding a touch of tech to the otherwise classy layout. Build quality is exceptional, and materials are plush and luxurious, with comfortable SVR-specific sport seats, with SVR embossing on the headrests, offering excellent comfort for long distances, but impressive support and bolstering for on and off-road excursions, even at pace. As a performance SUV, a stiffer suspension setup is to be expected – the Range Rover Sport SVR’s air suspension remains from lesser models though. As such, it’s supple in its comfort modes but firms up substantially when needed. It can still raise and lower the ride height for different tasks, meaning it’s (in)credible off-road, despite the performance it wields. But no matter how trick the suspension may be, and even in its firmest of settings, you can’t corner a five and a half thousand pound SUV without some serious body lean. But what surprises is just how well it supports itself at the extremities of that roll, still gripping, still feeling like it has more to give. The SVR will resist understeer and willingly power oversteer if you’re heavy enough with the throttle. It’s less British finesse and more American muscle than most would care to admit. The Range Rover Sport SVR has JLR’s 5.0-liter supercharged V8 lurking under the hood. For 2018, power outputs have been increased from 542hp to 567hp, and torque from 502 lb-ft to 516 lb-ft. An 8-speed automatic gearbox is standard, with high and low range transfer cases, and all-wheel drive – again not robbed of off-road ability by on-road performance. As for that performance, the SVR’s additional power for 2018 crops 0.2 seconds off the 0-60mph time of the old model – the sprint now taking just 4.3 seconds. Some rivals do it quicker, but few have the sense of theater the SVR has. Though the SVR model may be top of the performance hierarchy, it’s nearly but not quite the range topping trim – it plays second fiddle to the Autobiography – and is healthily equipped. SVR performance leather seats are standard, as is a powered tailgate, a rear-view camera, cruise control, and that 10.2-inch touch screen system. The SVR also gets a full virtual instrument cluster, three zone climate, a surround camera, and a 19-speaker Meridian audio system. As for safety, the Range Rover Sport hasn’t been tested by local authorities, but includes features like lane departure warning, autonomous emergency braking, and blind spot monitoring. For a vehicle that inherently defies logic, the Range Rover Sport SVR simply monsters all tasks before it. Immensely capable both on- and off-road, it’s no one trick pony. Though the Range Rover Sport is perhaps the perfect daily with a hint of performance, the SVR demands attention in a way few others can.